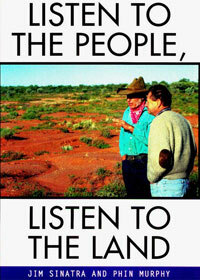 1999 Listen to the People Listen to the Land, Published by Melbourne University Press. I see the destruction of this country and I dare say somehow that affects you deeply…And if you’re completely broke what do you do about it? The last thing you are going to do is walk off. You just have to get better at looking after the land.What I’d like people to understand when they go to Lake Condah is that they’re in an area where traditional people have walked, talked, danced, and told stories; to feel the country… if you kill this country, you kill the people. We all go down together. The voices that speak to us from this remarkable book belong to ordinary Australians living in rural and remote areas. They talk with wisdom and passion about the land – our land. We would all do well to listen. The storytellers are pastoralists and graziers, opal miners, environmentalists, former city people who now propagate indigenous plants, Aboriginal men and women. The stories begin in the Kimberley in northern Western Australia and trace an imaginary line across the continent to Victoria’s Western District. Each storyteller knows intimately the particular beauty and complexity of his or her ‘country’. All despair about the terrible damage done by hard working settlers who did not understand the fragility of this ancient land. All are working at practical ways of balancing our modern economic needs with our valuable environment. Listen to the People Listen to the Land uses marvelous photographs to locate these authentic country voices, both settler and Aboriginal, in their own land. This beautiful book will inspire new respect and understanding for our precious landscape. AILA Victorian and Tasmanian Groups Landscape Excellence Award, 1999. AILA National Project Award in Landscape Architecture, Research and Communication, 2000.